The scalable Arkansas map on this page shows the state's major roads and highways as well as its counties and cities, including Little Rock, Arkansas' state capital and most populous city. To display the map in full-screen mode, click or touch the full screen button. To zoom in on the Arkansas state road map, click or touch the plus (+) button; to zoom out, click or touch the minus (-) button. To scroll or pan the zoomed-in map, either (1) use the scroll bars or (2) simply swipe or drag the map in any direction. (The scrolling or panning method you use will depend on your device and browser capabilities.) At any time, you can display the entire Arkansas road map in a new window or print this page, including the visible portion of the map. Arkansas's primary Interstate Highways connect its major cities and facilitate travel between Arkansas and its neighboring states. From its eastern terminus near Little Rock, I-30 travelers can drive westward toward the Texas border near Texarkana. I-40 traverses Arkansas, entering the state near Memphis, Tennessee in the east, passing through Little Rock, and leaving the state near Fort Smith, at the Oklahoma border. A short section of I-55 runs through northeastern Arkansas, along the Mississippi River valley between I-40 and the Missouri border. Arkansas's auxiliary Interstate Highways serve its major metropolitan areas. I-430 traverses the west side of Little Rock, between I-30 and I-40, while I-440 runs betwen I-30 and I-40 through eastern Little Rock and its suburbs. I-530 connects Pine Bluff with I-30 in Little Rock, while I-540 provides access from I-40 to Fort Smith and several northwestern Arkansas cities. I-630 connects downtown Little Rock with I-430 in western Little Rock. Scenic Highway 7 is a trip through Arkansas that is not to be missed. This road meanders from Harrison to Hot Springs, traveling through the Ozark and Ouachita National Forests and passing points of interest including Alum Cove National Bridge, the Buffalo National River, and Mystic Caverns. The caverns offer tours and give visitors an up-close peek at stalactites and stalagmites as well as giant pipe organ and crystal dome formations. 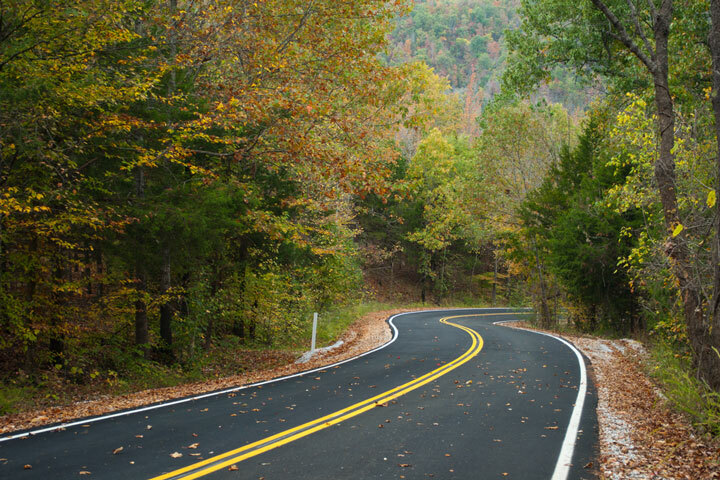 More information about scenic roads in Arkansas is available on this Arkansas Scenic Byways and Trails page. For more information about Arkansas's roads and transportation infrastructure, visit the Arkansas Highway and Transportation Department website. For Arkansas road traffic conditions, visit the Federal Highway Administration's Arkansas Traffic Information page.